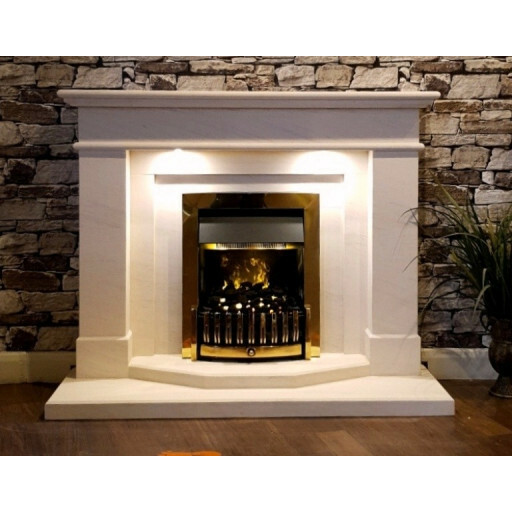 The Windsor Deluxe limestone fireplace is a high quality unit that would be a fantastic addition to any home. It comes in a popular size of 54" and is carved using nothing other than the highest grade of natural limestone. Much care is taken when designing and manufacturing these fireplaces, ensuring safety, top notch quality, and of course efficient heating. This elegant fireplace features a double hearth system that gives it unique character and style. If you're looking to make a bold statement with your fireplace, the Windsor Deluxe surely will not disappoint you with its truly classic feel as a focal point in your home. With professional installation, this fireplace will give you warmth, beauty, and a certain amount of classic elegance for many years. The Windsor Deluxe fireplace perfect option for anyone looking to give their living space an extra touch of style and class, not to mention warmth, and you wouldn't want to miss out on this fabulous piece. Easy financing for the Windsor Deluxe fireplace is available for qualified buyers and it comes with free mainland UK delivery. I bought this fireplace a couple of weeks ago and it has just been fitted, it looks amazing, totally changes the look of my living room - thank you!